Here is another exciting episode of the sleuthing adventures starring Popular Electronics' tech savvy teenagers, Carl and Jerry. 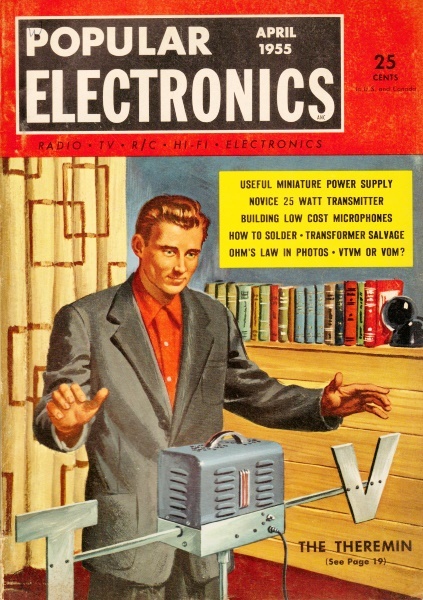 The Hardy Boys of electronics are the creation of author John T. Frye, who created short story adventures for many years - long enough to at one point require a major modification in their appearances to reflect more modern attire and eyewear. This particular adventure begins with Carl considering whether his ham radio hobby is more useful from its technical aspects or its social aspects. Carl discusses the merits of his ham radio hobby and whether it is more attractive because of the technical or social aspects. Spring fever had infected our heroes! 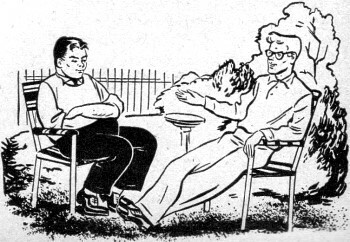 Carl and Jerry were busy getting the lawn furniture out of Jerry's basement and cleaning it. This chore finished, both promptly collapsed into a pair of still damp chairs in the middle of the back yard. The "churlik churlik" of busy robins filled the air and overhead a bright April sun beat down warmly upon them and induced a delicious, languorous drowsiness. Jerry sat hunched in his chair with his chubby legs curled beneath him, his hands clasped across his stomach, and with his head slumped forward on his chest so that he resembled a sleeping Buddha. Carl's long legs were stretched out in front of him, and he had slid down in the lawn chair so that only the back of his head, the seat of his pants, and his heels dug into the freshly-green sod were supporting his lanky frame. The sun shone through the lenses of his horn-rimmed glasses upon his tightly closed eyelids and created a beautiful, formless, dark-red void for his languid inspection. "Hey, Jer," Carl drawled feebly. "Uh huh," Jerry answered drowsily without stirring an unnecessary muscle. "I'm giving an oral theme Monday on 'What I Like About My Hobby' Want to help me dream up something on ham radio?" "I reckon you can sound off on all the reasons you can think of, and I'll add any I think you miss." "Okey-dokey. First off, I like amateur radio because it's a hobby in which you do things. It always sounds funny to hear some of the fellows griping about there being nothing to do. You and I can't find time to do half of the things we want to. There are always transmitters and receivers and test equipment to build and tryout. New antennas to be constructed and put up and tested. New circuits must be tried, and of course there's your amateur station to operate. This last is especially important because half the fun of any hobby is talking it over with other people who are as crazy about it as you are. No matter how lonely your neighborhood is, there are always hundreds of other amateurs ready and eager to talk ham stuff with you whenever you place your transmitter on the air. "Next, it's an exciting hobby. Every time there's a hurricane, tornado, flood, or other disaster anywhere within several hundred miles, I can have a front seat just by listening on my station receiver. What's more, I can often be of real help in relaying messages in and out of the stricken area for other ham stations who are right in the thick of things. But even when there is no emergency, operating a ham station is an exciting and suspense-filled experience. For example, when I pound out a CQ on twenty meters, I never know if I'm going to get an answer from half-way around the world-"
"Or perhaps from your old buddy right next door," Jerry broke in with a chuckle. "True! But that's part of the fun. It's like fishing. You never know just what you're going to pull out. I like the challenge to skill and muscular coordination needed to handle messages at high code speeds. Your nerves must be just as steady to send good clean code as they are to make a high score in rifle shooting or in tossing free buckets in basketball. Copying a guy who's throwing it at you at thirty words a minute means your mind and muscles have to work together as fast as lightning." "You're making it sound pretty strenuous," Jerry yawned. "Don't you have any reasons without muscles in them?" "Sure, my flabby friend. One thing is that it has prestige. Not just any stupe can be a ham simply by deciding he wants to be. That little old ham ticket on the wall says a lot of nice things about the guy who owns it. It testifies he's had the gumption to study the code, theory, and laws until he is capable of operating a complicated radio station. Who says so? Uncle Sam himself, because that license is granted by the FCC after giving a stiff examination that's no push-over, even for people who've spent their whole lives in electronics work. Many state governments, too, show what they think of hams by granting them special auto license plates with their call letters. The armed forces encourage this hobby in every way they can, even by having military stations work directly with the amateurs. They know that their best operators and technicians will come from this group. Red Cross and Civil Defense authorities are always ready to work closely with hams. Every time there's a major disaster, you can be sure the newspapers will carry stories on the wonderful work hams perform in restoring broken communications. A ham is somebody! "Another thing I like about hamming is that it allows me to acquire a lot of pretty complicated technical knowledge with hardly any pain or strain. When you're actually working with electronic equipment, reading interesting magazine articles about it, and talking about it with other guys on the air, it's amazing how much knowledge rubs off on you without your knowing it - knowledge that sticks with you, too. It's one thing to read that a parallel-tuned circuit presents maximum impedance at resonance and something entirely different to see the beautiful way in which a final amplifier plate current dips as the tank circuit is tuned through resonance." "Now let's not get sickening about this," Jerry objected. "You're beginning to sound pretty lyrical." "A dull clod with a slide rule for a soul!" Carl muttered. "Well, the final thing about ham radio that I like is the social side of it. By means of my amateur station I've become acquainted with all sorts of people I'd never have met otherwise. I know doctors, editors, lawyers, band leaders, radio and TV comedians, service technicians, policemen, radio station engineers, plumbers, dentists, school superintendents, and people in just about any other walk of life you'd care to mention. They call me 'Carl,' and I call them by their first names. On the ham bands It's not your age or your money or your fame that counts. All that really matters is the quality of the signal you put out with your transmitter and how good is your operating procedure. "And," Carl concluded, "it's always mighty comforting to know I can go into any strange city and find ham friends who will welcome me into their 'shacks,' whether it be a converted clothes closet or a spacious, beautifully decorated room in a mansion. A ham has friends wherever he travels." "That's a pretty good list of reasons you have, Carlos, amigo mio," Jerry remarked as he straightened up and stretched luxuriously. "I don't have too much to add, but I might say that while you like ham radio because it gives you something to do, I like it because it gives me something to think about. Trying to understand what goes on inside the transmitter and receiver circuits makes me call on every bit of math and chemistry and physics I've ever studied and causes me to realize that I need to know even more. I'm going to learn more, too; and that's another thing in favor of the hobby. It's sort of a sweet, juicy carrot that tempts the ham along the path leading to a career in electrical or electronic engineering. At the very top of every part of these fields you'll find men who first became interested in their work through the hobby of amateur radio. "Second, I know my hobby will never be outgrown. It has an equal fascination for all ages. Teenagers, the middle-aged, and retired people are all represented on the ham bands. Both of us know hams who have been following the hobby for thirty or forty years and are just as enthusiastic about it now as they were when they started. One reason for this, I think, is the fact that the hobby is a live and growing thing. New techniques and equipment are constantly being discovered and put to use. 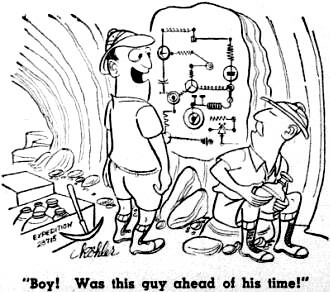 I like to hear the old-timers talk about how they've stuck with their hobby from the time they built their first rotary-gap spark transmitter through self-excited vacuum-tube transmitters, crystal-controlled rigs, the first crude telephone equipment, narrow-band frequency modulated jobs, mobile installations, and now single-sideband suppressed-carrier transmitters. Several hams are actually building and using their own facsimile and television transmitters. "And I must admit that being a ham does nice things to my ego. Here I am working with tiny electrons that can't be seen, felt, heard, tasted, or smelled; yet these powerful little 'assumptions' hop to my command and will carry my voice half-way around the world. When I try to explain what goes on in my equipment to a non-ham, he looks at me as though I were speaking an unknown foreign tongue. All this makes me feel smart and powerful. "Another good thing about the hobby is that it's one a whole family can enjoy right at home. More and more husband and wife amateur teams are heard on the ham bands these days; and it's not at all unusual to find families in which the parents and all the children hold amateur tickets. When so many present day forces tend to pull families apart, it is nice to discover a hobby that can draw them closer together." "Now wait just a little minute!" Carl exploded. "If you think I'm going to stand up in front of that English class and say I'm looking forward to having a silly wife and a bunch of little brats help me work my ham rig, you've got rocks in your head. I'd never live it down. I can just hear those dizzy dames in the class snickering right now." "All right, all right!" Jerry soothed. "Leave it out, even though it is a good point. Instead, you can sign off with this thought: as we two have just demonstrated one of the best things about this hobby is that it has so many different appeals. If you like to build things with your hands and watch them work, ham radio is your dish. The fellow who likes to study abstract theory will find an equal fascination here. Using code will appeal to the person who likes to master an exacting skill. If you are the social type and get your kicks out of just yakking with other people, amateur radio is the perfect hobby. 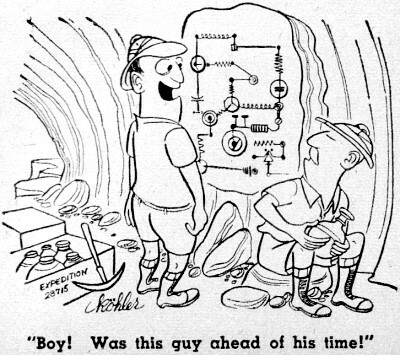 The experimenter who loves to try new circuits and techniques will never run out of material in his ham shack. And the person-"
"Hold it!" Carl broke in. "I think I've got the perfect idea to close the talk. You know how hipped Miss Richason, our English teacher, is on the use of quotations. Well, I happened to be glancing through a book on Roman history in the library the other day - this was my Latin teacher's idea; not mine - and I read a couple of paragraphs in which the writer was explaining why that doll, Cleopatra, was able to snow all the guys back in her day. As he saw it, she could do this because her personality had so many different forms. As he put it rather neatly, taking a line from the Bible, she was 'All things to all men.' How's about my saying that this is a perfect description of ham radio? All of us are in love with our hobby and never grow tired of it because it is 'All things to all men.'" "Perfect!" Jerry applauded. "If that doesn't wangle an 'A' for you, I'll eat my log book. And now we've talked about ham radio so much that I'm beginning to feel a nasty surge of ambition. What say we go down into the basement and put in a few licks on that two-meter rig of mine?" "I'm with you," Carl exclaimed as he jumped to his feet. "Let's go!"